Korean War Veterans Association, Gen. Frank Blazey Chapter 314 – Page 2 – Korean War Veterans Association, Gen. Frank Blazey Chapter 314 is a member of the National Korean War Veterans Association. Our Mission is to solicit donations from members of the public to support active military and veterans groups. Currently we are supporting the Veterans Restoration Quarters in Asheville which is a place for homeless veterans to be temporally housed and trained in various job skills. We also support fund raising for the expansion of the Korean War Memorial in Washington D.C. to add "A Wall of Remembrance " which will have the names of all those killed in action during the Korean War. 2. Treasurer Report: Approximately $1600 in the bank. Discussed to keep $500/yr minimum. 5) Korea Wall ($200) Suggested that members make a donation match for the Korea Wall in memory of someone through the chapter. c. Checking account: Louise Weber to be removed from account and Michele Bretz to be added. a. Thank you: Tiger Bang for Applefest and K-Wave tickets. b. Sympathy: Ron Evans family. a. Planning for Applefest to start earlier. c. .James will be working with Fremont on the new design of the tent/banner. d. Bill to check on Liability Insurance from National. 1) National KWVA in DC parade. Bill and Sandy maybe attending depending upon Bill’s medical release. a) 11 Nov Forest Lawn: Need individuals to assist with wreath laying ceremony (Korean War/POW/MIA). Michele Bretz to represent POW wreath and James Taylor to represent Korean War wreath. Flags to be placed at 8:30 am and ceremony at 11:00 am. 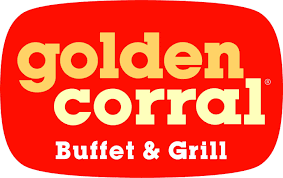 b) 12 Nov: Golden Corral. Members to come and assist with recruiting 4-9 pm in uniform. Advertising has been done by Michele to Asheville Citizen Times, Hendersonville Times, Transylvania Times and WLOS, FB pages for KWVA and WNC Military History Museum. Golden Corral has been decorated with a dedication to those members we have lost in the past year. c) 14 Nov: Next meeting at WNC Military History Museum at 11 am. James Taylor offered to meet individuals at American Legion to carpool. 1. Korean War Museum has been moved to the Truman Library. Bill to go there either March/Apr 2019. 2. Renaming of chapter to Gen. Frank Blazey. Invite family to attend when naming. 3. Quilts of Valor: get information for each member so that we can have a ceremony and also have one presented to those individual families that have lost a member in the chapter. 4. Membership Drive: every quarter add an informational recruit meeting to get new members and offer a Quilt of Valor. 5. Glenn to draft letter and send to Post 77 members who may qualify for KWVA membership. Michele to talk to Bob Scruggs for permission to obtain their roster. 6. Business cards for officers to be designed with Fremont. Families/ Descendents of Korean War Vet’s – Special Nov tour. The ROK government has just announced that there will be a special Korea tour in November for family members and descendants of Korean War Veterans. 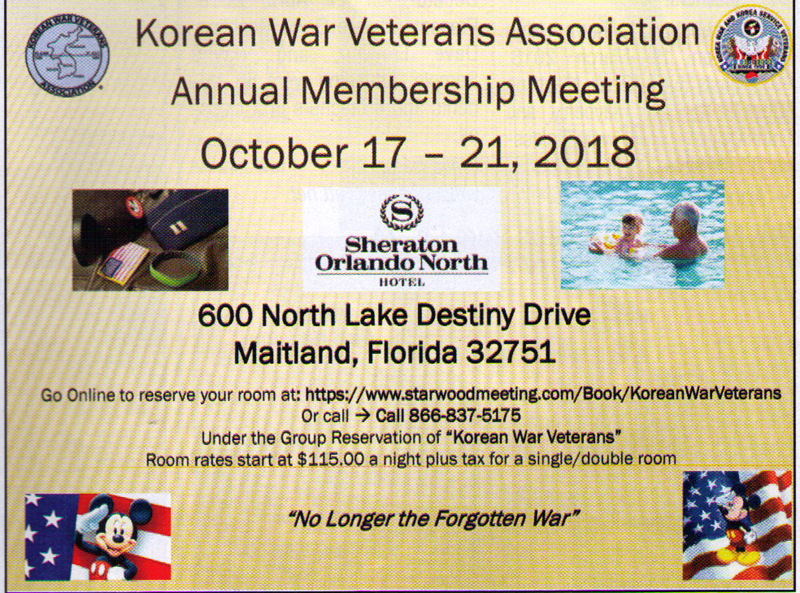 Sorry, “Veterans” will not be authorized on this special tour since the local itinerary will be orientated towards families and descendants, not veterans. Cost: ALL expenses in Seoul are free. Hotel, food, tours, etc. Airfare: 50% refund for the family member/descendent. 30% refund for the companion. * Passport must be good thru 9 May 2019. * You pay full airfare – refunds are made in Korea. For more information Email: Jamie Wiedhahn at: jwiedhahn@miltours.com. The haunting wail of a military bugle will echo off the polished granite structure known as the Wall of Remembrance in Brampton, Ont., on July 27, part of a commemorative service for the 516 Canadian soldiers killed in action in the Korean War from 1950 to 1953. At one of the most poignant moments during the service, the few remaining veterans in attendance will place a poppy on each of 516 bronze plaques on the wall, which are inscribed with the names of their comrades killed in battle. This year, the Brampton service and similar ceremonies across the country, taking place in various cities from British Columbia to Newfoundland and Labrador, will be special. July 27 marks the 65thanniversary of the armistice that ended the Korean War. For the few surviving veterans, it will be an emotional day as they recall the bitter hostilities between the two divided regions of the Southeast Asian country: North Korea (Democratic People’s Republic of Korea) and South Korea (Republic of Korea). 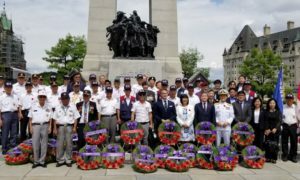 Once described as the “forgotten war,” overshadowed as it was by the two world wars as well as the Vietnam War, the Korean War is becoming increasingly recognized in this country for the contributions of the 26,791 Canadian soldiers dispatched to the front lines. 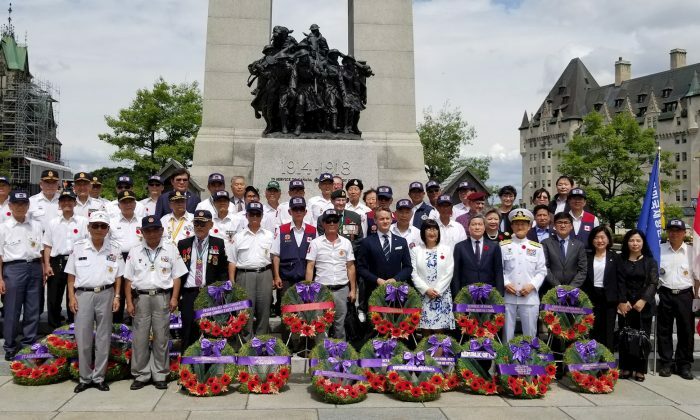 “After the U.S. and U.K., Canada sent the third-largest contingent of troops to the conflict,” said Shin Maeng-ho, Ambassador of the Republic of Korea to Canada. The Canadian soldiers sailed across the Pacific to join regiments from 15 other countries. They were part of a 16-country United Nations force that sent troops to defend South Korea after communist North Korean troops, armed with Soviet tanks, crossed the 38th parallel that divided the two regions and invaded the South in 1950. The survivors who returned retain deeply etched memories of the horrors and tragedies of the war. But they also take comfort in knowing that they played their part in defending the freedom of the South Korean people and in helping build the foundations of the strong and prosperous nation that South Korea is today. One such survivor is Bill Campbell, national president of the Korea Veterans Association of Canada, who enlisted at the age of 19. Today, at age 87, the former parachutist says he is “too old” to march with other veterans at the commemoration ceremony, but his memories of the war are as sharp as ever. A native of Cape Breton, Nova Scotia, Campbell was just 19 when he volunteered to serve in Korea, following in the footsteps of older family members who had fought in both world wars. “When we soldiers took the train to North Korea, we used to see thatched huts abandoned by refugees fleeing to the South, kids begging at train stations, and their parents completely disoriented. It was quite a shock, and even today I can’t forget that,” he recalls. Another veteran, 89-year-old Claude Charland, was an officer in the mostly francophone regiment Royal 22, colloquially known as Van Doos. Charland’s riveting wartime memories range from being ambushed at night and fighting in total darkness to trading his rifle once in a while for a hockey stick and playing a morale-boosting game with fellow soldiers on a frozen river behind the lines. “We have been recreating these hockey games each year on the Rideau Canal in Ottawa since 2013,” he says, adding that it was Sen. Yonah Martin, the first Korean-Canadian to serve in the Senate, who pushed for the memorial games. Senator Martin has in fact been a driving force in securing recognition for the bravery and sacrifices of Korean War veterans. In June 2013, a bill sponsored by the British Columbia senator received royal assent. Known as the Korean War Veterans Day Act, it designates July 27 as Korean War Veterans Day. Martin herself has deeply personal connections to the war. “Sixty-five years is a long time for families split apart to wait for a chance to reunite,” she says, referring to the situation of North and South Koreans whose families were separated by the war, often never hearing from one another again. “Unfortunately, my father passed away in 2008 and he will never see the family he lost,” she adds, her voice choking with emotion as she recounts the story of how her grandfather was forced to flee North Korea with some members of his family, traumatized at leaving behind her grandmother and one of her aunts who was pregnant at the time. Susan Korah is a freelance journalist based in Ottawa. She has a Master of Journalism degree from Carleton University and writes on Canadian and international politics as well as travel and culture. USA TODAY – CAMP HUMPHREYS, South Korea — The U.S. military’s newest and largest overseas base for 26,000 soldiers, family members and civilians is finally humming with activity — and buzzing about the growing threat from nearby North Korea. President Trump is scheduled to visit this $10.7 billion, 3,500-acre base in the city of Pyeongtaek during his stop in South Korea on Nov. 5-8 . Camp Humphreys, which became the headquarters of the Eighth Army in July, is located 40 miles south of the former base in Seoul and about 60 miles from the Demilitarized Zone that divides North and South Korea. That puts the base about twice as far from North Korea as its predecessor, one of the main reasons for the move. 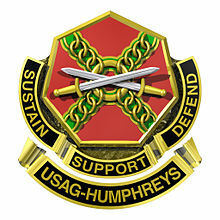 Click here to visit U.S. Army Garrison Humphreys website. KWV Chapter 314 meets every second Wednesday of the month at Noon at the Golden Corral, 2530 Chimney Rock Rd, Hendersonville, NC 28792.